Polls Open In The World's Largest Democracy: Fun Facts On India's Election Polls have opened in 18 Indian states and two union territories. 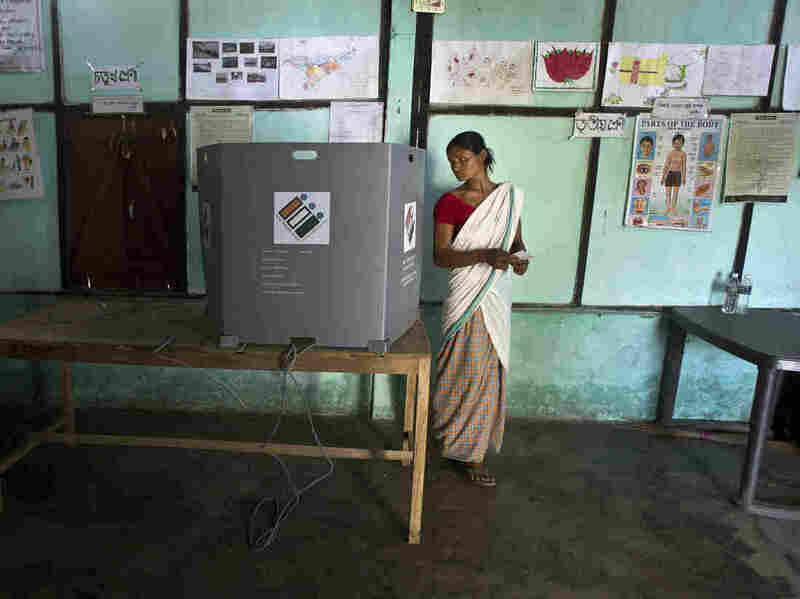 It is the first day of a seven-phase election staggered over more than five weeks in the country of 1.3 billion people. An Indian Mishing tribal woman looks back to ensure her vote has been cast as she prepares to leave the voting compartment during the first phase of general elections in Majuli, Assam, India, Thursday. Balloting is no single-day affair. Poll workers must reach voters from the Himalayas to tropical islands in the Indian Ocean. So voting is done in seven stages, over more than five weeks — through May 19. Then votes will be counted on May 23. Modi is the front-runner. He and his ruling Bharatiya Janata Party are running for another five-year term. The BJP is a Hindu nationalist party that's brought India's majority Hindu faith into politics and public life in unprecedented ways. Under the BJP, many Indian states have banned beef, because cows are sacred to Hindus. They've revised school textbooks and changed the names of Indian cities with Muslim-sounding names. Modi has campaigned as a pro-business, anti-corruption candidate, and he sought to portray himself as a safe pair of hands during recent violence with neighboring Pakistan. Modi's main challenger is India's main opposition party, the Congress party, and its leader Rahul Gandhi (no relation to India's freedom leader Mahatma Gandhi). Congress is a secular, socialist party that has pledged to protect India's minorities and improve life for the poor. It's a dynastic party; Gandhi's great-grandfather, Jawaharlal Nehru, was India's first prime minister. The party has been run by his descendants ever since, and it has dominated Indian politics until only recently. If Modi wins and serves a full second term, it would be the longest stretch of non-Congress rule since India's independence from Britain in 1947. Many voters see this election as a referendum on Modi's past five years in office. India's economy is one of the fastest-growing in the world. But unemployment has hit a four-decade high. Crop prices are low, which means food is cheap. But it also means farmers' profits are meager, and they've been protesting in the streets. Voters also care about national security, after India and its archrival Pakistan — both nuclear powers — exchanged airstrikes this winter. Indian law says no one should have to travel more than 2 kilometers (about 1.25 miles) to vote. So poll workers have fanned out across the country, setting up polling stations wherever there's even a tiny settlement. They trek through the jungle to bring voting machines to a man who lives alone in a lion-infested forest in the western state of Gujarat, and climb to nearly 15,000 feet above sea level to set up a polling station for 12 residents of a village in the northern province of Leh. All voting is done by electronic voting machine, or EVM. The tabletop machine looks like a miniature piano keyboard, with buttons next to a list of political parties and also symbols — for those voters who might not be able to read. The machines fit into small suitcases, which poll workers have carried across glaciers and through deserts — even hoisting them overhead as they ford rivers to reach voters. Some poll workers have to take helicopters to reach remote settlements of voters. 2: Anglo-Indian seats in India's parliament. Those are seats reserved for members of the British community who stayed behind in India after the end of colonial rule. 300 million: Estimated number of Indians on Facebook. This is the social media site's largest market. The Indian government has expressed concern that fake news, spread on Facebook and the phone messaging app WhatsApp, could sway voters. Facebook says some 40 million rupees (half a million dollars) has been spent on political ads in India so far.